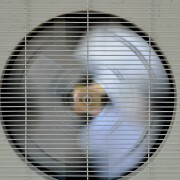 A clean air conditioner is more energy efficient and better for your health. That's why cleaning it is important after a period of storage or disuse. Although cleaning a portable air conditioner is fairly easy, give yourself a few hours if it's your first attempt. Here are some tips to get you going. First, unplug the unit and lift it out of the window or wall opening. Next, place it on a sturdy work surface and remove its front cover and case according to the manufacturer's instructions. Get someone to help you with this step! 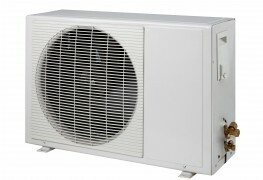 Air conditioners can be very heavy, especially older models. Remove the filter from the front grill and either wash or replace it. 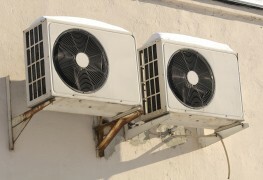 Special dust filters on some models of air conditioners that remove pollen and other allergens may not be replaceable because of the "fineness" of the filter mesh. The manufacturer's instructions will tell you. Using a brush attachment, thoroughly and carefully vacuum the evaporator fins. Straighten any bent fins with a fin straightener comb, sold at HVAC parts suppliers. To wash the condenser coil (best done outdoors), first ensure the unit's drain holes are open, and cover the fan motor and its wiring compartment with a plastic bag. Use a garden hose to spray down the condenser coil from the outside. Rinse away any grime that collects in the unit's drain pan. Then wipe off any water left after the pan has drained. When the air conditioner is completely dry, lubricate the motor with electric motor oil. Five drops at each accessible port should do the trick, but consult your owner's manual for specifics. Cleaning the air-conditioning filter at least once a month during the cooling season is essential. Wash the foam or metal mesh filter in warm water with a squirt of dishwashing liquid. Rinse and let dry thoroughly before reinstalling the filter. Always replace disposable filters with a new version of the same model. As the air-conditioning season wears on, there's a good chance your unit's drain tube could become clogged by algae. Check your A/C's drain tube by inserting a piece of wire into the drain tube, which is accessible from the underside of the unit. Move the wire around the tube's interior to scour out algae, if there is any. Next, using an old medicine dropper, pour a teaspoon of household ammonia into the tube to prevent new growth. Each spring, check the seals and gaskets around the air conditioning unit to make sure they're not leaking air. Leaks mean cool air can escape and hot, humid air can enter the room being air conditioned. Repair or replace any that are deteriorated. Window-mounted air conditioners work less efficiently in direct sunlight. If possible, mount your air conditioning unit on a shady wall or put an awning over the window to minimize exposure to the sun. After you've completed the last step to clean the air conditioner, replace the unit's casing and cover. Then return the air conditioner to its mounted position.